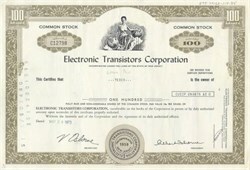 Beautifully engraved Certificate from the Electronic Transistors Corporation issued in 1973. This historic document was printed by the Federated Banknote Company and has an ornate border around it with a vignette of a woman sitting flanked by two globes with a jet flying by. This item has the printed signature of Albert Osborne as President and is over 27 years old. The company's name was later changed to Orion Diversified Technologies.